The Humboldt Folklife Festival, July 16-23, offers some fantastic opportunities to kick up your heels. While the early part of the week is dedicated to concerts, dancing takes over Friday night, July 22: The annual Festival Barn Dance at the Arcata Vet's Hall is not to be missed. Monthly barn dances held by the Folklife Society "have become an incredibly vibrant scene under the guidance of Tara Stetz and Humboldt's Striped Pig Stringband," says Folklifer Maia Cheli-Colando. With Stetz in Alaska for the summer, out-of-town caller Tony Mates is stepping in to call out instructions for square dances, big circle dances and line dances like the Virginia reel. Mates, a 30-year veteran, called a dance with the Striped Pig Stringband at the Portland Old-Time Music Gathering in January. Local banjo maker and player Colin Vance, of Striped Pig, and his bandmates were familiar with Mates, having danced to his calling before. Vance notes that a good caller "has to be on it; ahead of the dancers. It's just perfect to find out Tony is going to call with us here, too." Mates, who will be traveling from his home in Seattle to attend the festival, explained that it is not uncommon for a caller to work with many different bands. "The tunes are the same and there is an ethos about performing that a lot of people follow. The sound has to be tight -- no slackers -- so we're able to call." That's one thing Vance loves about this music. "It's a sound wall of melody and rhythm, all to propel the dancing. Everyone has their part to play, each musician, the caller and the dancers." If you've never been to a Barn Dance before, there's no need to be shy. Each dance is taught before it begins. Mates, known for his clear delivery, enjoys a good band behind him and a floor full of dancers in front. "It's fun to be in front of a big crowd of people who may or may not know much about social dancing and get them up and moving quickly and having a good time. If they do it in time with the music, then we can call it dancing." Barn dances are great community builders. You don't need to come with a partner. Get to know your neighbors during the exchanges that happen on the dance floor where, Mates observes, "there's often generation mixing; a 6-year-old may be dancing with someone's grandfather." What a great way to party with your friends and make new ones. Truth be told, Mates has seen, "many a romance that started at a Barn Dance." Be there and be square. 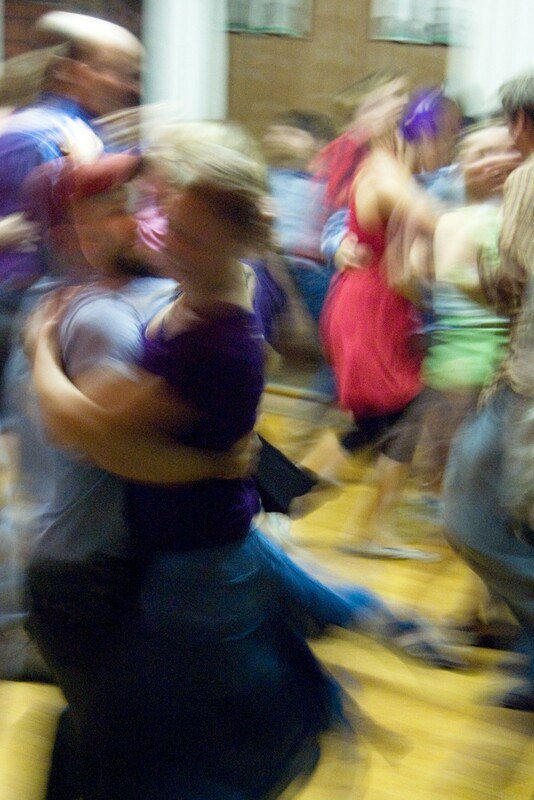 The Festival Barn Dance, at the Arcata Vet's Hall, 1425 J St. goes from 8-11 p.m. Friday, July 22. Admission is $7 or just $6 for Folklife members. Those who have feel the urge to shout out "swing your partners" and have people, well, swing their partners will head for Blue Lake the following day where Tony Mates leads a Caller's Workshop at the All Day Fest (at 3 p.m. in the Carlo Theater). The Humboldt Folklife Festival concludes with Saturday's All Day Free Fest, July 23, a day packed with workshops and performances where the entire Dell'Arte building, the stage in back and the street in front become a music and dance free-for-all. The fest is, literally, free for all Saturday, no charge for the concerts or the music workshops or for taking a dance class. Shoshanna Rose of Middle Eastern dance fame starts her fest day with a kids' bellydance class on the main level of the Carlo at 1 p.m. The raucous annual event, Rose calls "a big, wild extravaganza," is attended by babes who can barely toddle, all the way up to teens, along with parents who help out from the sidelines. The young'uns learn basic belly dance technique, simple arm and hand movements, some shimmies and a few Middle Eastern Dance steps. Shoshanna comes armed with a suitcase full of exotic veils and jingly scarves the children adore trailing through the air. At 2 p.m. in a spacious upstairs studio with mirrors, some of the older kids "who have been inspired and want a dance class environment," head right into Shoshanna's adults and teens class. The workshop focuses on the foundation and basic technique of Middle Eastern social dance giving participants "a taste of the music and sensibility of belly dancing, through the rhythms of the culture it comes from." Also starting at 1 p.m. Sue Moon, mistress of Irish, English and other European Social Dances teaches easy-to-learn steps from these traditions accompanied by her Wild Rumpus Band, versatile musicians who have played for these dances since the very beginnings of the Humboldt Folklife Society. Fiddles, accordion, guitar, flutes and whistles drive the dance steps Moon teaches. In fests past people have left her workshops exhilarated by the spry music and lively partner gamboling. The Humboldt Folklife All Day Free Fest takes place Saturday, July 23, from 10 a.m. to 8 p.m. at Dell Arte in downtown Blue Lake. For the complete Folklife Festival schedule go to www.humboldtfolklife.org or see the insert in the Journal later this month.